M-Series MAGNETIC SPRING CLUTCHES - Tiny Clutch | Helander Products, Inc. The M-Series Tiny-Clutches combine the high torque capacity of a spring clutch with the convenience and control of a conventional electric clutch. Based on a standard wrap spring clutch, with the added feature of an electromagnetic coil that actuates it, these clutches consumes a mere 2.5 Watts of power. When power is off, the hub & shaft are free to rotate independently. When power is on, it causes the spring to wrap down, coupling the hubs together & transmitting torque. The slight magnetic force is used only to maintain a tightly wrapped spring. 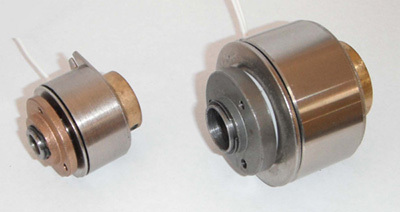 The sleeve is screwed or pinned to your shaft & clutch may be driven through either the sleeve or the hub. M-Series Tiny-Clutches are available for shafts up to 13mm, torque loads up to 50in/lb & speeds up to 3000RPM. Special input or output hubs are available upon request to suit customers' needs. We will design & build special or modified clutches for your application using stock components. Clutches can be supplied with gears, sprockets, pullies or as complete mechanical assemblies consisting of clutch, shaft and adjacent parts. * Short version, Cross Slot mounting Only. ** Hub & mounting on same end of clutch. *** No hub, housing has fixed mounting tab. Tiny-Clutch M-Series Clutches should be mounted so that a stationary pin engages the slot in the torque arm. It is important that the torque arm is not firmly screwed down but allowed to float, as this may prevent the clutch from operating normally. We can provide a variety of adapter hubs made to your specifications to adapt our clutch to your application.